How to watch Despicable Me 3 (2017) on Netflix Portugal! Sorry, Despicable Me 3 is not available on Portuguese Netflix, but you can unlock it right now in Portugal and start watching! With a few simple steps you can change your Netflix region to a country like New Zealand and start watching New Zealand Netflix, which includes Despicable Me 3. We'll keep checking Netflix Portugal for Despicable Me 3, and this page will be updated with any changes. 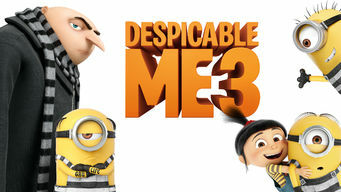 Despicable Me 3 is not available in Portugal BUT it can be unlocked and viewed! After failing to arrest an '80s child star turned supervillain, Gru loses his job but gains a family member when he learns he's got a long-lost twin. First he was a bad guy. Then he was a good guy. Now he's got an evil brother who wants him to join the family business. There is a way to watch Despicable Me 3 in Portugal, even though it isn't currently available on Netflix locally. What you need is a system that lets you change your Netflix country. With a few simple steps you can be watching Despicable Me 3 and thousands of other titles!